Auto crashes are the leading killer of American teens. The anguish of losing a loved one in a totally avoidable car crash has to be one of the most devastating things a family could face. More than half of high school juniors and seniors admit to texting or emailing while behind the wheel, according to the first federal statistics on the dangerous habit. A typical teen sends and receives about 100 text messages a day, and it’s the most common way many kids communicate with their peers. 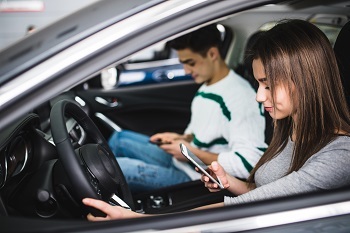 Teens acknowledge they know it’s not safe, but some think it is safer to hold the phone at eye level so they can see the road and text at the same time. Thankfully, his prophetic words were only partially correct. Upon arrival at the hospital, it was found that he had an open compound fracture to his ankle, a punctured lung, multiple facial fractures and lacerations, and a severe skull fracture with brain bleed. He was released after spending six months of his young life in recovery that included multiple complete facial reconstructions. While teens are at an increased risk of the avoidable tragedies caused by texting while driving, they are not the only drivers guilty of the activity. A 2010 study revealed that 52% of U.S. drivers aged 18-29 reported texting or emailing while driving at least once in the prior 30 days, and more than a quarter reported texting or e-mailing “regularly” or “fairly often” while driving. And a texting driver is 23 times more likely to get into a car accident than a non-texting driver. The attorneys at Neblett, Beard & Arsenault have represented victims of auto accidents for decades. Increasingly, we are seeing totally avoidable accidents caused simply by the inattention or distraction - whether by texting, using a phone, emailing, etc. - of drivers. We urge all our clients to follow the mantra Buckle Up and Turn Off the Phone every time you climb into the driver’s seat and encourage your loved ones to do the same.